The Supreme Court slammed both the government and CBI for not taking the probe as well as CAG report in the Rs 1.76 lakh crore 2G spectrum scam seriously. A bench comprising Justices G S Singhvi and A K Ganguly first questioned Mr K K Venugopal, appearing for the CBI, for not naming the two companies named by the Chief Vigilance Commissioner (CVC) in his letter to CBI which was the basis of the FIR registered in October 2009 against unknown persons. Solicitor General of India Gopal Subramaniam was also reprimanded by the judges who asked him ‘why are you taking the CAG report non-seriously? 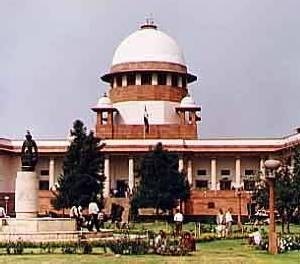 CAG is also a Constitutional authority appointed by the Government and its findings cannot be treated in such a non-serious manner.’ The Supreme Court, adjourning the hearing till November 30, permitted CBI to file the status report in the Supreme Court in a sealed cover giving details of the investigation carried out during past 13 months, including the names of the companies and individuals who have been investigated and interrogated till date. The court permitted CBI to file status report when Mr Venugopal himself offered to file a status report. The apex court was irked with Mr Venugopal when he objected to the hearing of the PIL on merits. Justice Singhvi asked the CBI counsel, ‘Why were the two companies that have been named by the CVC not named in the FIR? The companies got the spectrum allocated for Rs 1500-1600 crore and sold the same for Rs 6000 crore within a few days. Was it not sufficient to name them as accused and investigate?’ Counsel for the petitioner Prashant Bhushan submitted before the court that the cut-off date was arbitrarily advanced from October 1, 2007 to September 25, 2007 leading to the elimination of 343 applicants out of total 575 applicants for spectrum allocation. The date was advanced in January 2008 with retrospective effect. Mr Bhushan also pointed out that on October 18, 2007 Tiger Trustee, a company owned by Reliance group of Anil Ambani, transferred 50 lakh shares for Rs five crore to some foreign company when it was having Rs 1000 crore in its bank account. The CBI has not tried to find out to whom these shares were transferred. The apex court was also surprised by the stand taken by DoT that accepting the advice of Law ministry for referring the matter to empowered group of ministers will lead to further litigation. Justice Ganguly reacted by saying, ‘Litigation is not a crime and it does not mean that you will not do the right thing only because people may go to the court.’ The Supreme Court brushed aside the objection of the CBI to the petition being heard on merit instead of confining to the limited issue of monitoring the investigation by the Supreme Court. Solicitor General of India Gopal Subramanium informed the court that the government was awaiting TRAI opinion on the issue of cancellation of licenses granted by former Communications minister A Raja.